Denise Cormier and Patrick Boll in Bill W. and Dr. Bob. BOTTOM LINE: Two former alcoholics join forces to help people with the same ailment in this touching and engaging worldwide hit. When it comes to recovery stories, there is always a “Come to Jesus” moment: the moment when the world no longer possesses enough palatable reason and you must lift your hands in divine acquiescence. I bring this up not to say Bill W. and Dr. Bob is only a play about the failings of man and the goodness of God, but it strongly intones that remark -- no harm doing in the process. But, where is God? The play does a fantastic job of leaving that answer blank and instead highlights fractured characters to bring on a moral message: importance of community. Only sinners deal with sin, after all. As Dr. Bob (Steve Brady) and Bill W. (Patrick Boll) fight their demons they also involve neighbors, strangers, and wives to help. It takes a village to run the devil outta town. 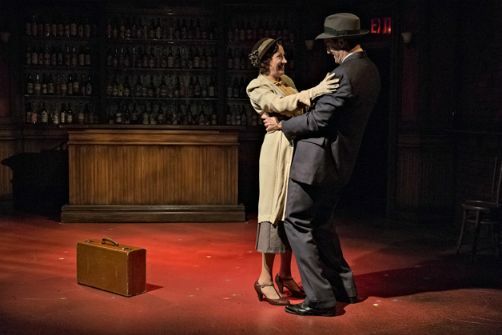 This Soho Playhouse production is ensconced in nostalgia: the mid-20th Century is welcome and warm despite the heaviness of alcoholic issues such as relapse and loss. The lighting never seems stark, but cool and reposed. These were conquering stories being retold through a triumphant lens. There is a scene when Bill, in another facility for drunkenness, suddenly awakes to see a warm light hovering above him. Is it revelation, is it God himself? This sort of intentional storytelling makes the piece personal. The whole show is familiar, in fact; even the audience will utter “Hi, Bob!” after an introduction, in AA fashion. This familiarity is often challenged by unexpected characterizations, though. Dr. Bob is a revered surgeon with a housewife. He just happens to get sloshed every day. The two men’s stories are paralleled in an especially dynamic way, underscoring their eventual creation of a treatment process. Yet, the crux of the play centers on each man’s personal alignment with such a process. It makes the audience member recall what vices he has tucked away. The language, liberally taken from Bill and Bob’s own personal narratives, is terse and straight forward. This play is not sentimental, but intentional. As the first act ends, the friend I invited simply whispered, “beautiful” in the darkness. I have to second that emotion. When seeing this production try to leave your idea of AA and treatment aside, even if the relevancy is fresh. The story speaks on the creation of a worldwide aid, but more emphatically it speaks on the necessary good of community -- and a step further, male vulnerability. The characters move through the history lesson with a very earnest stride. I didn’t feel lectured to or held hostage, for that matter, by the content. Instead, I received a history lesson brimming with real human frailness -- the dramatic stuff of dreams. Because if we’re not shown these lives, how could we account for our own? Theater as mimesis: very recommended.